PNNL is partnering with Percheron Power, LLC, to help the Kennewick, Wash.-based small business make hydropower cheaper. PNNL is helping Percheron evaluate using composite instead of steel to make screw-shaped turbines called Archimedes Hydrodynamic Screw turbines, which enable hydropower generation in small waterways. 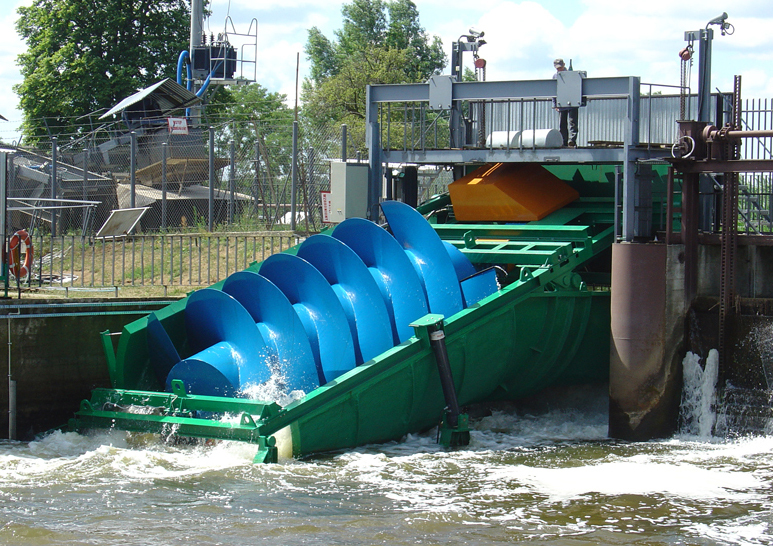 Shown here is a steel Archimedes turbine at a hydropower plant in Goryn, Poland. RICHLAND, Wash. — Hydropower costs could be reduced, buildings could use less energy and adhesives could be made from plants under three new projects announced today by the Department of Energy. "The Small Business Vouchers pilot allows innovative entrepreneurs greater access to the world-class resources and brilliant minds in our (national) labs," said David Danielson, assistant secretary for DOE's Office of Energy Efficiency and Renewable Energy. "These partnerships can help small businesses solve their most pressing technical challenges — and help bring clean energy technologies to commercialization much faster." DOE also announced today that more small businesses can now apply to receive vouchers through the second round of this program. Second round applications are due April 10. More information can be found at the Small Business Vouchers Pilot website. Small and medium-sized commercial buildings could cut their power bills with the help of national lab-developed algorithms that improve lighting, heating and cooling systems by identifying systems that aren't working as intended — such as thermostats that don't change temperatures at assigned times — and correcting them. But while these algorithms have worked well in experiments, they need further refinement to be ready for real-world use. For more information, see today's DOE announcement. The full list of 33 companies being awarded vouchers today is available on the Small Business Vouchers Pilot website.